Wait! I'm very confused now! Do i always need to power cycle everytime i want to disable in game hooks besides turning all options off in sd2snes menu? No. Once they're disabled, they're disabled until you enable them again. He's talking about how to get back to the SD2SNES menu on a Super NT without turning off the console. You could do with by pressing L+R+X+Select if in-game hooks are enabled, but if they're disabled, you have to either hold reset for 3 seconds (or the Super NT reset hotkeys for 3 seconds) or power cycle the console. On Analogue Super Nt, hold "Select and Up" for a few seconds to hold reset and then it will put you back at the Sd2SNES menu. No need for in game hooks. Does this method still work for SRAM saving? As in, it will still "hard reset" the console and still save games after making them? If that's the case, then I can test Yoshi's Island without wearing out the reset or power buttons. Maybe I'm not understanding how that works, I may wait for SD saving to be re implemented. It should. It works exactly like the reset button. Sweet, I can test Yoshi's Island and have it save in-game on my SD2SNES. copy the files in the sd2snes/ (firmware.img, fpga_gsu.bit, fpga_base.bit) directory into the sd2snes/ directory on your SD card. You should have a working version of the sd2snes 0.1.7e firmware on the SD card before doing this. - Verify the version says 0.1.7e-gsu-v01 in the sd2snes menu. Do this by pressing X->System Information. - Turn off in-game hooks in the sd2snes menu. They crash several games. - Saving to SD is temporarily disabled. Make sure to hold down the reset button for a few seconds to write a save file to the SD. - PAL games and systems are not well tested. Try a NTSC game on a NTSC compatible console if you have problems. - Games may crash on startup. Power cycle and try again if they do this. Make sure in-game hooks are disabled in the sd2snes menu. - Random graphical glitches may happen on game startup. Power cycle and try again if they do this. - Doom has graphical glitches. - Stunt Race FX may have graphical glitches at the beginning of a race. - Games may not run at exactly the same speed as the original cart. This may improve in future versions. - Not currently compatible with usb2snes or other sd2snes firmware modifications. This will be fixed for usb2snes in the future. This beta firmware has all the other features of the official 0.1.7e firmware? I asked why I will keep this beta while we do not have the final version. 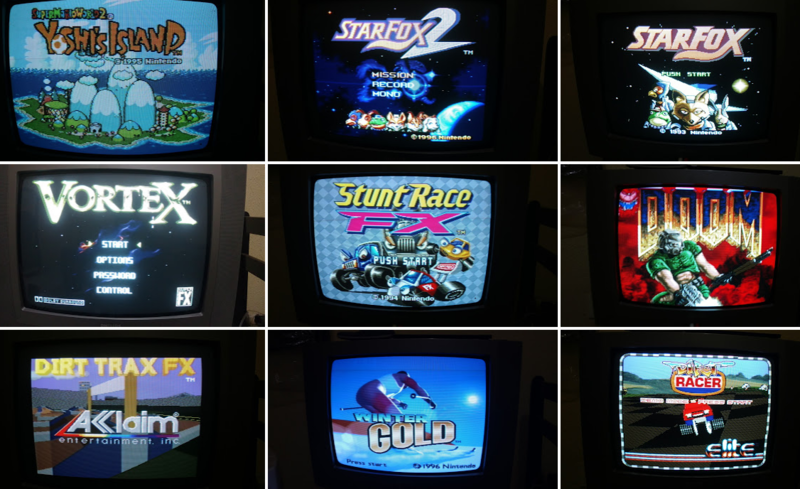 Here's Smokemonster testing all of the Super FX games! A quicker way of doing it is hold your reset hotkeys (Up+Select by default) for 3 seconds. Redguy clearly stated that if the graphics are scrambled, you should power cycle the console. The graphic glitches in GSU games have nothing to do with the DSP roms, I think it was mere coincidence. Actually what he stated is that if games won't load you then should power cycle. That said I should clarify that before I added the DSP chipsets Doom loaded up perfectly for me with no power cycling required. After adding the chipsets I had to power cycle a couple of times to get it to run fully as it began just hanging at menu before moving to a never ending black screen. Secondly I never said or implied graphical glitches had anything to do with the DSP chips just that certain Super FX games would not fully load or play for me at all until I added them for whatever odd reason ie SMW2: Yoshi's Island would only show a garbled logo screen with a Nintendo chime until I added the DSP chips. Star Fox 2's screen looked liked a rave party with all it's flashing lights before I added the DSP chips. Stunt Race FX's gameplay was unplayable due to the screen moving from left to right rapidly until I added the DSP chips, etc, etc. Again I don't know why this is as I'm not a programmer but thats my experience with all of this. Also if this information helps Redguy or someother programmer to know I believe I have the "Rev" version of the SD2SNES that was released before the current revision krikzz is selling on his website now...with the current version krikzz is selling that I think people have said is somewhat better for playing MSU-1 enhanced games. krikzz products I own: SD2SNES, Joyzz, Everdrive GB X7, Everdrive GBA X5, Mega Everdrive X7, Everdrive 64 v3, Everdrive N8, Turbo Everdrive v2, Master Everdrive X7. THANK YOU everyone involved that made this possible, your hard work is very much appreciated!!! How do you properly synthesize the core in ISE? Every time I try to do it, I get a black screen on whenever the core is trying to be used (ie DOOM after the title screen or Star Fox on bootup). I'm synthesizing it like I would the base core (Regenerate all cores, then Generate Programming File for main.v, then compressing it with rle). Also with a quick test, the latest firmware commit seems to have fixed the saving after reset issue for non-GSU games, but I haven't done much testing here. @Syboxez on Discord and some other places as well. Yoshi's island seemed to work with this firmware. Yoshi revenge hack crashed, Star fox 2 hangs. Needs some work keep up the good work. I hear you struggled putting fx in there. Work and perfect the fx before you move on. herd you had to take out the usb part to put the fx in i don't mind. I hope for SA-1 firmware in the future. If it doesn't fit I don't mind having separate sd cards with different firmware's for the different chips. I really hoped for the SA-1 first only cause a super fx muilticart exists. It's kinda my own greed I guess. I just got it like 2 weeks ago also. has all the games that got released including the super nes classic version of star fox 2. Atleast I can play the fx games in working manner. Someone else can correct me if I'm wrong, but I'm pretty sure the FPGA is programmed with the necessary "core" at the time when you launch a game from the menu. So, its not a matter of whether the FPGA can hold all the different "cores" for all the different chips at the same time. The SA-1 is basically a higher-clocked equivalent of the CPU that's built-in to the SNES. The concerns with it not fitting in the SD2SNES FPGA are that it, by itself, likely cannot fit on the existing FPGA. A new hardware revision would likely be necessary. I had the same problem with a freshly pulled source tree. It now works after commenting out "`define DEBUG" in gsu.v:78. Darn, that's unfortunate if true.